So many butterflies! So many different species seldom seen here before, like this beautiful Red Lacewing (cethosia cydippe) which we are now seeing all over the property. I took this shot this morning alongside our walking track - I'll post some other varieties over the next day or so. A real kaleidescope of colours in the gardens and on our walking trails! 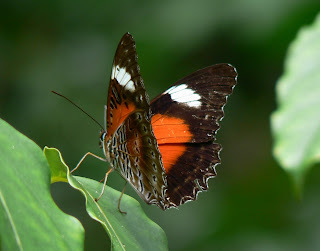 Hi I am new to your blog - I discovered it looking for the red lacewing butterfly. I am happy to see that we can see it in this area. Butterfly viewing has been marvelous this year.